There are a lot of things you can do with your immersion blender and if you have your heart set on making delicious soups, you need to make sure that you are using the right product. To help you decide which is the best immersion blender for soup, here are the top products we are more than happy to recommend to you. 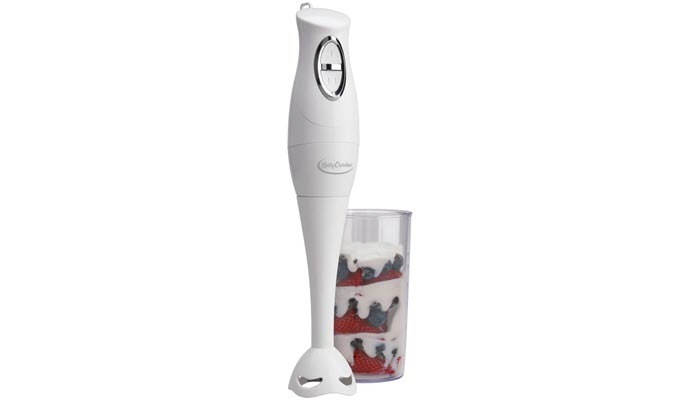 XProject 800W 4-in-1 Hand Blender is a multi-functional product. 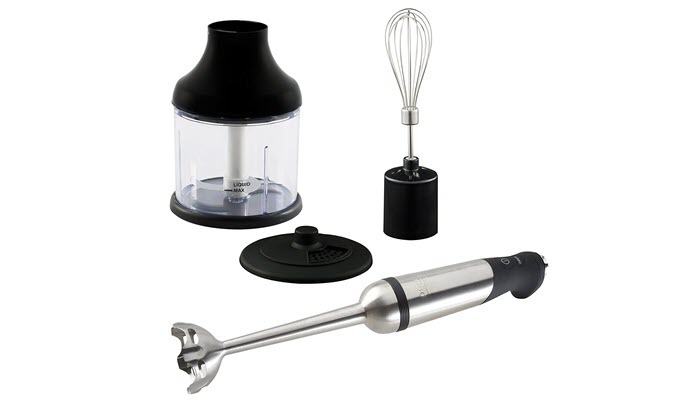 Apart from the immersion blender, it also comes with a 500ml food processor, a whisk, and a 600ml beaker. It comes with a splash guard as well so you won’t have to deal with any food splatter after. 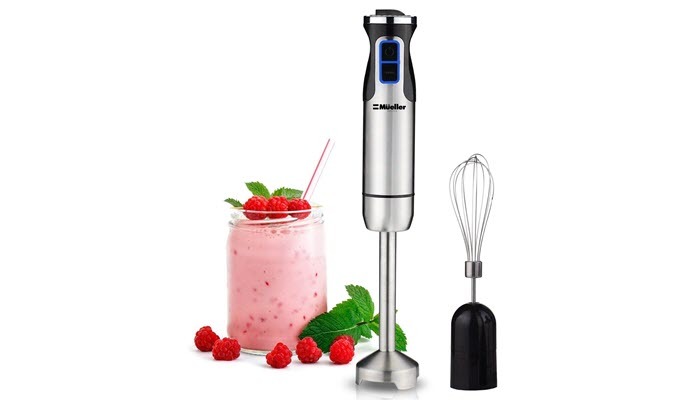 With 800 watts of power, this immersion blender can help you beat eggs, make sauces, create healthy smoothies, chop meat, and even cut vegetables. And to give you more control over the blending process, it has 6 different speed settings you can choose from. You can go as slow or as fast as your recipe requires. Its blades are extra sharp to help you achieve a consistent and uniform texture after blending. The actual device, on the other hand, feels nice and sturdy on the hands. It’s easy to hold while being able to access its turbo and power buttons. Betty Crocker Hand Held Immersion Blender Stick with Beaker has this sleek look, making it easy to blend with the other appliances you have in the kitchen. It features an ergonomic design so your hand feels comfortable while whipping up your favorite recipes. This immersion blender has 400 watts of power. It can puree, slice, mince, blend, and chop ingredients with ease. With its two-speed pulse action, you can conveniently use it to blend a delicious smoothie or a creamy soup on just a few seconds. When it comes to cleaning, this product won’t give you a hard time. It’s dishwasher safe and its blending shaft detaches. All-Clad KZ750D Stainless Steel Immersion Blender is a perfect choice if you want something that works fast. With this product, you’ll be able to create baby food, puree soup, blend smoothies, and chop nuts fast. This immersion blender has a powerful 600-watt motor and a large blending head that minimizes splatter when in use. It also has a pulse function to give you added control over your mixture. Using this immersion blender is a breeze. It has an extra-long shaft which can reach deep into bowls, pitchers, and pots. It’s made of stainless steel which guarantees durability. Mueller Ultra-Stick 500 Watt 9-Speed Powerful Immersion Multi-Purpose Hand Blender offers exceptional quality despite its affordable size. It has a full copper motor that can withstand continuous use, making it perfect for people who love working non-stop in the kitchen. 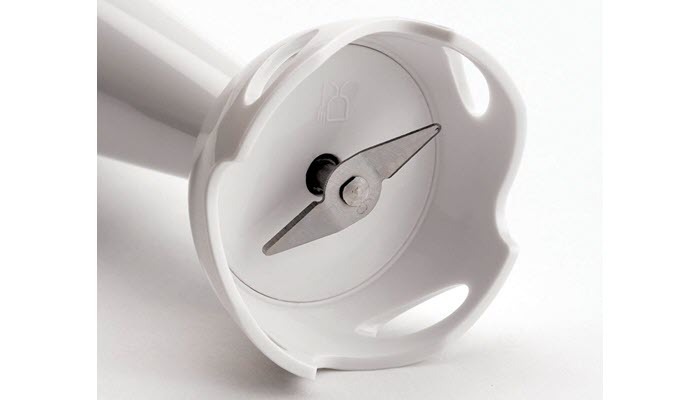 Additionally, this immersion blender has a removable blending arm and a fixed blade that locks into the motor’s body. This makes the appliance really easy to use and operate whether you’re making milkshakes, baby food or smoothies. One thing you might not like with the product is the high pitched whine it creates when in use. Apart from that, the bottom of the steel shaft can get very warm. It’s a good indication of excess friction. Other than those issues, you’ll love how well this immersion blender performs. Still can’t decide? Here are the factors you need to consider when choosing the right immersion blender for you. One of the first things you need to check when buying an immersion blender is its control buttons. Make sure that they are easy to press and that they aren’t tiring to use. They should also be easy to access and reach when using the appliance. Immersion blenders are more likely to stain than those made with metal shafts. So, if you are planning on creating lots of soup, you’ll find an immersion blender with a metal shaft a more convenient choice. A higher wattage doesn’t necessarily mean better results. It doesn’t mean that a unit is any more durable than others. In general, an immersion blender with 200 watts of power should be enough for most blending tasks. Advanced models can have 4 to 6-speed controls which means that they offer more flexibility and precision. Low priced models, on the other hand, have the two basic speed settings- low and high. Some immersion blenders come with beakers and bowls you can use in preparing your ingredients. They are handy for tasks like chopping, whipping, whisking, and blending. Choosing a heavy immersion blender can cause fatigue quickly. With that, try to find an immersion blender that’s lightweight and easy to grip. You should be able to operate it with ease even with just one hand. Immersion blenders need to be cleaned after each use. This is to prevent food debris from accumulating and settling on your appliance. For convenience, pick one that’s dishwasher safe. If you don’t have a dishwasher at home, then pick a blender that’s easy to clean by hand. 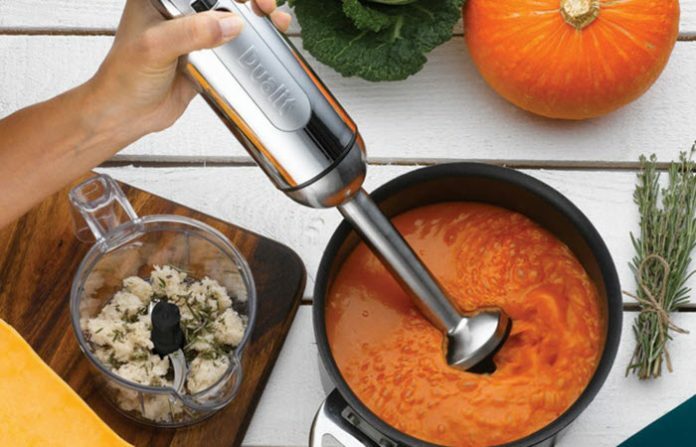 XProject 800W 4-in-1 Hand Blender is the best immersion blender for soup you can get these days. Being multi-functional, it saves you from the cost of having to buy separate products just to complete a recipe. Additionally, it has an 800-watt motor which can help you complete most of your blending tasks in the kitchen. 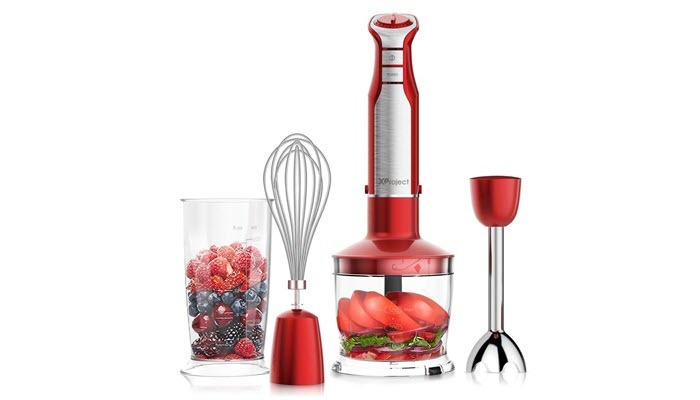 It even comes with a food processor, whisk, beaker, and splash guard. Buying these accessories separately can cost you a few extra dollars. Now, if you prefer a full blender but you worry about its high cost, there are actually affordable blenders you can invest in. If you want to get more out of your unit, consider investing in a blender that can double as a food processor. There are a lot of options out there so be careful when making a choice. Know your preferences and needs first.